OSHA Celebrates World Cancer Day? We all have reminders on our calendars for such things as holidays, birthdays, and appointments. As I looked forward to February for some planning purposes, the date of February 4th popped up as World Cancer Day. Is this a day to celebrate cancer? Does that even make sense when most of us upon hearing that word have some pretty strong negative reactions and emotions? This sent me on a path of fact checking. The purpose of World Cancer Day as established by the Union of International Cancer Control (UICC) is to raise awareness of cancer and to encourage its prevention, detection, and treatment. So, this day is similar to Earth Day or World AIDS Day then. Since I work in the Regulatory World, I thought this would be an opportune time to talk about cancer in the realm of Hazard Communication. For many cancer is part of the acronym CMR which stands for materials that are carcinogenic, mutagenic or toxic to reproduction. In OSHA HazCom 2012, Appendix A Subsection 6 covers the definition, classification criteria, and cut-off values for carcinogens. Are those pieces of information really enough to classify all of your products? Granted the regulation points out in A.6.2.5.2 some factors to consider, but those exact particular factors can be hard to find in many full length cancer studies. Clarification provided by OSHA’s Inspection Procedure, Directive CPL 02-02-079 in July 2015, is filtering through the regulated community and causing some concern. The directive essentially confirms that HazCom 2012 labeling applies to “… a tank truck, rail car or similar vehicle…” comprising the container for a hazardous chemical when it is not immediately unloaded at the destination. The intent is presumably to ensure that workers potentially exposed to hazardous chemicals will be able to identify the risks, particularly if they are not familiar with DOT markings – or if the substance is a hazardous chemical under OSHA, despite not being a hazardous material under DOT. 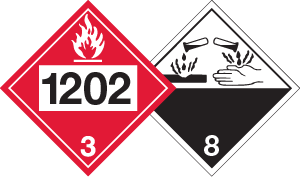 The wording of 29 CFR1910.1200(c) is light on definitions of “container” (“…storage tank or the like that contains a hazardous chemical…”); and “shipped container” in (f)(1) et al is not actually defined in the regulation itself. Sending a copy separately from the vehicle is not allowed.